Artist Carlos Frésquez will discuss Chicano art April 2 in a free presentation at Ohio Wesleyan University. His work, including pieces from his “Salon de los Ilegales” series, are on display at OWU’s Gallery 2001. Artist Carlos Frésquez says his colorful, eclectic artwork is “inspired by the Picassos in the museums and the placas (graffiti) on the streets.” The Denver artist will discuss Chicano art, including his own creations, April 2 at Ohio Wesleyan University. Frésquez will speak at 6:30 p.m. in the Bayley Room of OWU’s Beeghly Library, 43 Rowland Ave., Delaware. A reception will follow in the library’s Gallery 2001, where his “From Here, From There” (Desde Aquí, Desde Allí) exhibition is on display through May 19. Both events are free. “The reality of Chicanismo guides me to personally define my history but also gives me a hybrid reality to deal with the present and to look to the future,” said Frésquez, a professor at Metropolitan State College of Denver. The inspiration of Chicano art, or embracing one’s roots in Mexico, is evident throughout Frésquez’s Gallery 2001 exhibit. 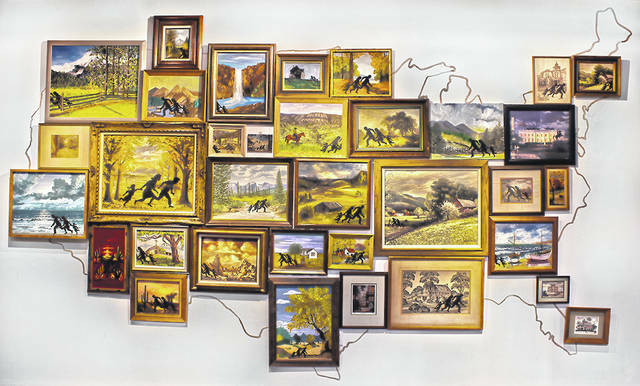 The display includes 11 pieces from his series “Salon de los Ilegales,” structured originally in an outline of the United States. For the series, Frésquez purchased thrift-shop landscapes and added shadowy figures appearing to run through the canvases. The artist’s drawings, sculptures, prints, installations, and paintings have been shown in 30 U.S. states and 10 countries. His work has been featured in exhibitions, including Arte Caliente and CARA – Chicano Art: Resistance and Affirmation, one of the first Chicano art exhibitions to gain national recognition from the press. Frésquez also has spoken at universities, art centers, and galleries such as The Bronx Museum, The San Francisco Museum of Modern Art, and Las Bellas Artes in Mexico City. He earned his Bachelor of Arts from Metropolitan State College of Denver and his Master of Fine Arts from the University of Colorado, Boulder. Learn more about Frésquez at www.carlosfresquez.com. Learn more about Ohio Wesleyan’s Ross Art Museum and its satellite galleries, including Gallery 2001, at www.owu.edu/ross.